There are few places in Canada where it can be said "I boated over a mountain." Well, if you’ve boated the Rideau from Kingston to Smiths Falls, you can boast to all your friends that you did, truly, boat over a mountain. “What mountain?” you ask. A mountain that was part of the Grenville mountain range, what is known today as the Frontenac Axis. When Colonel By looked at the difficulties of building a navigable waterway to connect the Ottawa River to Kingston, he knew that he had many challenges that had to be overcome. “Providing navigation over a mountain” wasn’t one of them, but that’s exactly what he had to do. He knew from the existing surveys that he was climbing to a summit, the top of which was at Newboro. He also knew that the area south of Oliver’s Ferry (today’s Rideau Ferry) marked a geological transition to different types of rocks than those found to the north. His initial concern with those rocks was that they weren’t suitable as building blocks for the locks and dams. They were too hard and fractured to be shaped into blocks – he had to find more suitable rocks, such as sandstone or limestone, that were located outside of this area. And, at Newboro, when he dug down he found out just how difficult it is to excavate through some of these rocks, eventually adding a lock at Narrows to avoid having to excavate any deeper at Newboro. So, what are these rocks anyway? They are very old rocks, part of what’s known as the Canadian Shield. They were originally formed 1.35 to 1.06 billion years ago in a shallow marine environment. Then, about 900 million years ago they were metamorphosed (deformed by heat and pressure) to form the rock types we see today; mostly quartzite, marble and gneiss. Near the end of this deformation period, granitic rocks (plutons of granite, syenite, and monzonite) were intruded. Other rock types that were added to the mix include migmatite, gabbro and pegmatite. The metamorphism occurred during a mountain building event as the proto-North American continental plate collided with the proto-South American plate. The mountains that were built as a result of this were analogous to the Himalayan or Andes mountain ranges today (really big!). They extended from Labrador to California and into Mexico. When the collision stopped, the mountains ceased to grow and ever-present erosion started to wear them down. Erosion changed to deposition when continental drift brought the eroded remnants of our part of the mountain range to the area of the equator, where, 520 to 460 million years ago, a shallow sea deposited new marine sediments on top of these older rocks. These sediments turned into the limestone, sandstone, dolomite and shale that we can see on either side of the Frontenac Axis. The Frontenac Axis is exposed today because it represents a topographic high – the remains of the highest part of the original mountains. The thickness of sediments deposited over these higher parts of the old mountain range was less than on either side and this allowed those sediments to be eroded away, exposing these old rocks. As much as Colonel By found these rocks more annoying than useful, by the mid-1800s mineral discoveries were being made in the rocks of the Frontenac Axis, which led to some small scale mining that continued into the early 20th century. The first mine on/near the Rideau Canal (excluding the small scale iron mining near Lower Beverley Lake) was the iron mine on Iron Island near Newboro opened by the Chaffey brothers, John, Benjamin and Elswood, in about 1850. By the late 1800s, numerous small phosphate mines were being operated (for fertilizer, most was shipped to England) and by the turn of the century, there were many small mica mines in operation. After the opening of the Rideau Canal, the lands underlain by these rocks were occupied by homesteaders, who found the poor soil cover a challenge for any type of farming. By the 20th century, these farms were being abandoned with a new activity, cottaging, taking their place. The rocks of the Frontenac Axis provide an ideal environment for recreation activities. The topographic expression (hilly) of these rocks host numerous lakes. These lakes provide for great recreation opportunities including boating, fishing, swimming - uses that continue to this day. They also form what can only be described as pretty (aesthetically pleasing) landscapes. And these pretty landscapes provide a rich ecological habitat for numerous species of plants and wildlife. So, this summer, get into your boat, head out to the locks between Kingston and Smiths Falls and do some mountain climbing (no hiking boots required). While the Rideau Canal has been in winter hibernation, your Board of Directors has been busy on a number of fronts following issues related to the Canal and taking part in discussions along the Waterway. We have been following closely developments with respect to the Rideau Corridor Landscape Strategy. There have been several meetings of the Steering Committee over the winter, with the most recent being on April 1. You can get information on the Strategy via www.pc.gc.ca. We were very disappointed to hear that the Steering Committee has decided not to establish a Community Advisory Committee, as called for almost two years ago in the decision to create a new governance structure for the Strategy. They have decided that a public consultation process, as part of a Landscape Character Assessment (timeframe for this unknown), is all that is required. From our point of view, both types of public input into the strategy are required – they are very different types of public input and one does not substitute for the other. Friends of the Rideau participated in the Ottawa Boat and Sportsmen’s Show at Lansdowne Park February 24-27, and by our simple reckoning we met over 1,000 people and told them about our organization, distributed pamphlets on behalf of Parks Canada regarding fees and hours of operation of the Canal, and sold books – especially Ed Bebee’s tomes on fishing and the fishing guides along the Rideau. Friends also participated in the meeting convened March 30 by Parks Canada to discuss risks posed on the northern section of the Waterway from ever-increasing boating traffic levels and personal watercraft, wakeboarding and other uses never imagined by Col. By. We compliment Parks for taking this initiative despite its complex implications given the widely differing views of the many stakeholder groups. See the article on page 4 for details. In preparation for the coming season on the Rideau we have reprinted Ken Watson’s ever-popular and indispensable “A History of the Rideau Lockstations.” We have also acquired small Rideau-themed souvenir items including postcards and keychains. So do come and see us at The Depot in Merrickville or at one of the several events along the Waterway at which Friends will be present (see “Out and About” on page 3 for a listing of events) and stock up, for your own use or as gifts for deserving family and friends. I look forward to seeing you at our Spring Meeting on May 14 and along the Rideau this summer. As the summer approaches, we’ve been looking at the calendar of events along the Rideau Waterway and considering which ones we can participate in. As of mid-April, our plan is to be present at the following events and should you be attending we would be delighted to talk with you and hear of your interests and concerns, as well as tell you about what Friends is doing on your behalf. At these events we will have a supply of our popular publications and attractive, Friends of the Rideau-logo shirts and caps. The season begins with the Westport Heritage Festival, June 18, in one of the prettiest villages on the Waterway. Then there is a bit of a gap until the Rideau Canal Festival in Ottawa on the August long weekend (July 29 to August 1), with the Monday designated Col By Day in Ottawa. The Merrickville Canalfest is the same weekend (July 30 to August 1) and The Depot, our interpretation and retail outlet in the village, will be open then. The Antique and Classic Show hosted by the Manotick Classic Boat Club is on Saturday, August 13, and we always enjoy the relaxed setting and historic ambiance of that event at the Long Island Lock Station. Closing out our list of activities will be the Rideau Ferry Yacht Club Regatta, which we understand will be the weekend of August 20-21 in Rideau Ferry. Should you be able to join us to help staff the Friends’ booth at any of these events we would be delighted to have your company and your support. Let us know by email (info@rideaufriends.com) if you are coming and we will make sure you have all the necessary logistical information to find us. It has been almost four years since the Rideau Canal was designated a World Heritage Site by UNESCO. There has been pride along the Rideau Waterway at this international recognition of the canal’s outstanding heritage values. But how to preserve and protect the qualities and features that earned the UNESCO designation? What are the issues and actions which must be dealt with by all of us along the Rideau to properly fulfill our responsibilities as custodians of this World Heritage Site? Come and hear Dr. Christina Cameron speak on these topics. Well, the spring weather has finally arrived and Parks Canada is gearing up for another great season here in Eastern Ontario. As I mentioned in my last letter, 2011 is a very special year for Parks Canada, as its 100 years as the world’s first national parks service is celebrated throughout our parks and sites across the country, all year long. It’s a great pleasure to work for an agency that represents such a vast and varied body of work that honours Canada’s most important cultural and natural treasures, preserving them as a legacy of those who came before us, for all Canadians now and in the future. As we start this new season, I would like to thank the Friends of the Rideau for their continued interest in and unwavering dedication to the betterment of Rideau Canal National Historic Site. I wish you the best the season has to offer in 2011, and as always, your questions and comments are always welcome. There are no changes in fees or hours of operation for the 2011 season. Paddler-Friendly Docks: This summer, you can expect to see a bevy of new paddler-friendly floating docks along the whole length of the Rideau Canal to facilitate easier access to and from canoes and kayaks at many of our lockstations. Start looking for these new docks with the beaver logo on them around Canada Day. Rideau Corridor Landscape Strategy Update: At the last meeting of the RCLS Steering Committee on April 1, discussions focused on the Community Consultation Group and the draft Request for Proposal for a landscape character assessment of the Rideau Canal Corridor. The Steering Committee moved to enhance the public consultation process being directed by the consultant to ensure a more comprehensive and inclusive participation from all interested groups and individuals. The Steering Committee also reviewed the RFP to hire a consultant to undertake a landscape character assessment of the Rideau Canal Corridor and to develop a suite of planning and management recommendations. As a result of concerns expressed by shoreline residents and boaters regarding risk to public safety and shoreline erosion along the Rideau Canal, Parks Canada initiated a number of studies to help understand the issues. These studies included a review of historical data, a survey of boaters, stakeholders and shoreline residents, as well as a risk assessment conducted by James Wright, a Certified Risk Manager (CRM), and a Shoreline Vulnerability Study. On March 30th a working group, which included 25 key stakeholders and business owners from in and around the Northern sector of the Rideau Canal, met to review the findings of the studies (primarily public safety as the environmental study has not been fully explored), and provide recommendations that will help ensure visitor safety and ecological health are maintained in this sensitive area of the Rideau Canal. The group included representative(s) from Transport Canada, Ottawa Police, Canadian Power and Sail Squadrons, Friends of the Rideau, Rideau Valley Conservation Authority, Wakeboard and Ski Schools, Manotick Community Organizations, marinas, Office of the Member of Parliament for Nepean-Carleton, Councillor for Ward 21 Rideau-Goldburn and Parks Canada. The working group concluded that excessive wake, more so than speed, was indeed the problem; however it noted that non-regulatory efforts to control excessive wake have not been fully exhausted. It was felt that additional speed zones limiting or restricting all recreational tow-sports was not the preferred answer, with a few exceptions; and that those who participate in tow sports would benefit from attending safety training courses. The message that “no wake” and speed zones need to be more clearly defined and that more education is necessary to ensure boaters understand the meaning of symbol signs on the waterway were articulated. During the meeting there was full realization that managing the identified issues will require community involvement, as well as full support and participation from every group represented at the workshop. At this point, Parks Canada will analyze all recommendations and establish well defined options prior to public consultation. It is important to note that Parks Canada cannot make any regulatory changes, including addition or extension of a speed zone, without consulting Canadians and receiving approval by Transport Canada. Once Parks Canada is ready to ask local residents for comments on proposed actions, the public will be invited to participate in the consultation process. Notification of this public consultation will be through emails, posters and public notices in the local newspapers. At that time, Parks Canada will gladly welcome all comments and suggestions. For further information please contact Mary Ann Steinberg at 613-283-7199 ext. 243. On April 18, at the declaration of the City of Ottawa’s first World Heritage Day, Jo McFadden, member of Friends of the Rideau’s board and well-known film and TV producer, was presented with the Rideau Canal Festival World Heritage Award for her work in preserving, protecting and publicizing the Rideau Canal. Congratulations to our friend and colleague. Jo is currently working on the development of a four-part docu-drama, “Canada’s Rideau”, for television. Follow the link for the “Where are We” contest. We’re very pleased to announce that not one, but TWO new Books on CD have recently been completed - part of our program to convert Rideau research documents (Parks Canada’s manuscript reports) into digital books, making them easily available to the public. 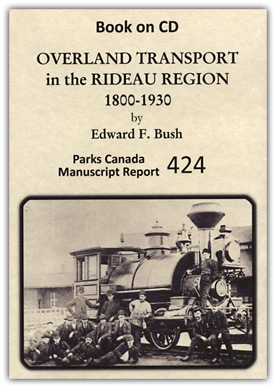 The first is “Overland Transport in the Rideau Region, 1800-1930” by Edward F. Bush, 1979. This 397 page reports deals with the development of roads and railways in the Rideau Region. The first section of the report covers road development from early pioneer wagon tracks to the inception of the provincial highway system in the mid-1890s. The second section deals with the coming of the railways in the 1850s and the development of three regional railways and two diagonal trunk lines. The third section provides an account of the building of the provincial highway network as it applies to the Rideau Region. Some 34 graphs, maps, photos and illustrations round out the text. 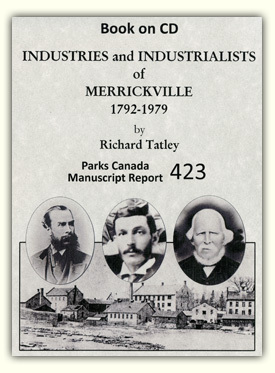 The second is “Industries and Industrialists of Merrickville, 1792-1979” by Richard Tatley, 1979. This 736 page report deals with the industrial operations in Merrickville, powered by water, steam and electricity over the span of 189 years. It also discusses the men who ran these, such as the many Merricks (William, Aaron, Stephen, George, Henry, etc. ), Hiram Easton, John Mills, Thomas Watchorn, Roger Percival and more. The village has hosted at least 58 industrial operations, which included sawmills, grist mills, shingle mills, a snath factory, a sash and door factory, an axe factory, a furniture factory, tanneries, carding mills, woolen factories, several foundries (incl. Percival Plow & Stove Co.), a fence factory, boat works and brass works. Some 23 maps, photos and illustrations round out the text. Both reports provide fascinating insights into the development of the Rideau Corridor - from its pioneer days, through the industrialization of the 19th century and into the modern era. Bush and Tatley are not only excellent and very thorough historians, but are also good writers, distilling large masses of information into readable documents. Both reports are heavily endnoted so that you can find the source information that these researchers used. Our thanks to FoR volunteers Helen Parson and Alec Rait. Helen did the OCRing (conververting digital scans into text), proofing and formatting for Overland Transport and Alec did the OCRing of Industries and Industrialists of Merrickville. Project co-ordinator, Ken Watson, completed the work required to make each of these documents a book on CD. Thanks too go to Ellen Manchee, a historian with Parks Canada, who was able to locate the original camera-ready copies of both these reports and sent them to Ken for high resolution scanning of the images/illustrations. We are donating 2 copies of Report 423 to Merrickville, one to the Merrickville and District Historical Society and one to the Merrickville library so that residents of Merrickville can learn more about the heritage of their community. As noted in the last newsletter, we have two more reports being worked on by FoR volunteers; The Second Tay Canal in the Rideau Corridor, 1880-1940 and Commercial Navigation on the Rideau Canal, 1832-1961. We will let you know when these have been completed. These two newly completed reports bring our Book on CD total to nine. They are available via our website (mail order) and during the summer at The Depot in Merrickville. We also usually have a few on hand at the various events we attend (see “Out and About” on page 3 which outlines some of the Rideau’s summer events).